This month's Chocolatier assignment over at Crop Chocolate was to scrap something Travel or Vacation related. I used the new "Little Boy" line from Echo Park and ended up making two layouts to fit the theme. 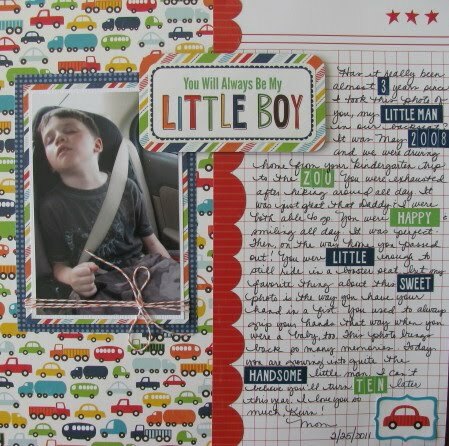 For my first layout, I found a shot of Kevin sleeping in the backseat on the way home from the zoo. Has it really been THREE YEARS since this photo was taken??? LOVED the multiple alpha stickers and word phrases in this kit. I added some to my journaling. Love how that turned out. But, the story is the most important part of this layout. Everything on this layout was included in the paper pack except for the orange/white baker's twine I added and pop dots, of course. 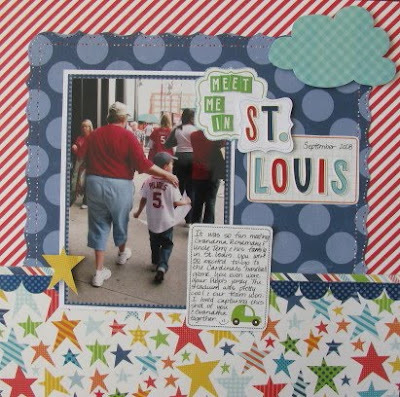 I found another photo from 2008 to scrap for the vacation topic - our trip to St. Louis. I loved mixing the patterns from this line. I cut some "tags" out of the journaling card paper to use as a backdrop for my mixed alpha title. And, I added a cloud sticker from the paper pack (adhered with pop dots). I love this Amy. I have only now found my scrappy mojo again and starting to love the feel of glue and paper on my hands. I love that car paper! So cute! And your journaling on that layout with the stickers is an awesome idea! Oh loving these layouts! Your pages are always so amazing.